Well, after seeing American Hustle the other day I can safely say that I have found my new favourite film of the year (if we go by the American release date). I know; I said the exact same thing when I saw Gravity and I’ll probably say the exact same thing when I see The Wolf Of Wall Street in a week’s time but, for now, that’s how it is. American Hustle is the best film I’ve seen in a long time, perhaps even better than Rush, back in September. American Hustle is just that good, and in my mind it deserves to win all 10 of the Oscars it’s nominated for. Except maybe best actor; I think it’s time Leonardo DiCaprio got some Oscar recognition. Here is my review of American Hustle. The film starts out with a very funny scene of Christian Bale’s character, Irving, trying to sort out his extremely elaborate comb over all to the sound of America’s ‘Horse With No Name’. This scene sets up the rest of the film perfectly; from the understated humor right down to the look and sound of the film. From there Irving meets up with the other characters; Bradley Cooper’s Richie DiMaso, a slightly unhinged FBI agent, and Amy Adams’ Sydney Prosser a fellow con artist who was in a relationship with Irving but is now with Richie. From there characters are seen trying to set-up the Mayor, Carmine Polito, played brilliantly by Jeremy Renner. The film then flashes back to how the characters came to be there and how they involved themselves in the unfortunately real AbScam plot. While the plot is great, and keeps you hooked throughout, the main appeal here is the characters with the real stand outs being Bradley Cooper and Amy Adams. Christian Bale is as great as ever but this is sort of expected of him by now; he always does a brilliant job even in lesser (but still awesome) films such as Equilibrium. Cooper on the other hand has almost reinvented himself last year by providing the best performances of his career in both American Hustle and The Place Beyond The Pines. Cooper has always been a pretty good actor, but in these films he is down right amazing. His turn as the slightly weird, unhinged FBI agent Richie in American Hustle might just be my favourite character of the year and, hopefully, he can win the Oscar for best supporting Actor. Amy Adams also deserves special mention for her character Sydney, or Edith as she’s sometimes known. Edith is the character Sydney plays when conning people, complete with Adams doing a British accent, which is suitably wonky. Adams is arguably the star of the film, with the other characters of Irving and Richie both loving her and being motivated by her. And although she breaks the heart of Irving you never stop to hate her, her motivations are completely believable and her performance completely draws you in. Adams is up their with Sandra Bullock in Gravity for the years best leading lady and her portrayal of Sydney marks her fifth Oscar nomination for what I think is her strongest role to date, so hopefully she too can bag an Oscar. Also Oscar nominated is the always great Jennifer Lawrence as Irving’s wife. While perhaps not as good as Amy Adams, Lawrence still stands out and has quite a few memorable scenes, the highlight being when she lip syncs to the classic Bond theme ‘Live and Let Die,’ by Wings. I admit I did have reservations when I went to the cinema to see American Hustle. I hadn’t been a fan of previous David O. Russell films, except the brilliant Three Kings, and it is a well known fact that David O. Russell is a director renowned for his violent outbursts, often overshadowing the film itself. For example; what’s more memorable I Heart Huckabees or the infamous on set meltdown? But with American Hustle he’s seems to have mellowed. Everyone in the film seems to be having fun while also putting in their A-game performances. Russell’s direction is better than ever as well, with the film using a lot of sweeping shots and long shots, reminiscent of the best Martin Scorsese films, all set to a brilliantly congruous 70’s soundtrack. In fact the soundtrack deserves a special mention, purely for being just so downright awesome, and fitting for the film. Any soundtrack with ELO on it will always win praise with me though. As well as the great direction it’s worth noting just all of the famous faces that also turn up a some point or other throughout the film. Famous faces including Robert DeNiro, making a good case for why he’s still a great actor. Seriously, get this guy back in a Scorsese movie for god’s sake! Other actors include the underrated Michael Pena making a hilarious appearance as a fake sheikh and Louis C.K. playing Richie’s hysterically downtrodden boss at the F.B.I. All of these characters don’t make the film feel over stuffed though, and each character works perfectly to forward the film, until we are left with an extremely well balanced cast, perhaps even the best ensemble cast of the year. 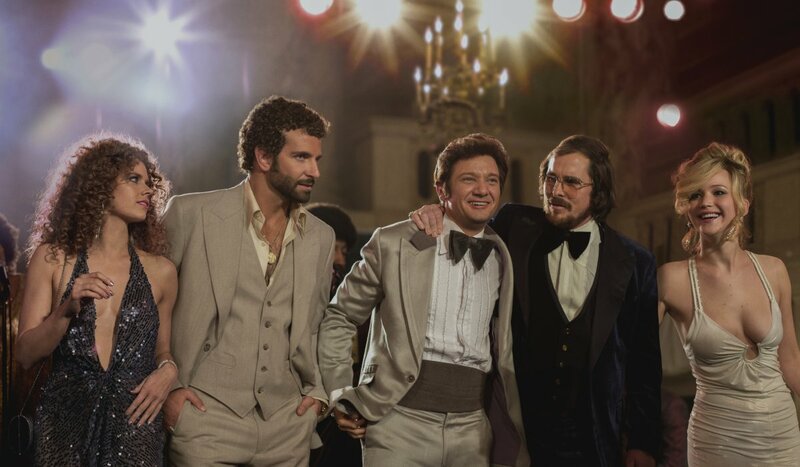 The Bottom Line: American Hustle might just be my favourite film of 2013. It’s both an insanely fun film and brilliantly put together one; the film has you believing you’re watching a movie from the early 70’s. As well as this all of the performances are note-perfect and are perfectly complimented by a very funny and well written script. 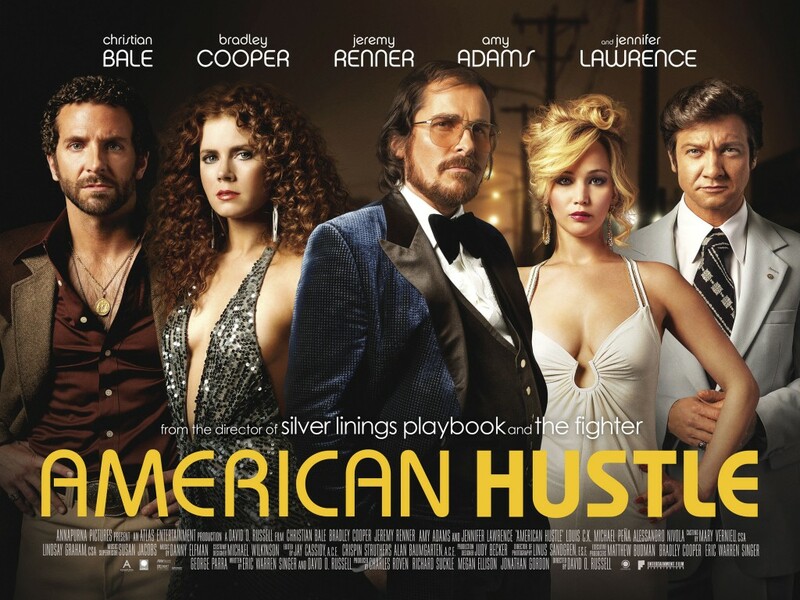 A few detractors are saying the film is too long and boring, but if you have the attention span above that of a small child then American Hustle might be the most fun you’ve had at the cinema in a long time. Go and see it now! This whole cast was a treat to watch and just play around one another. Especially whenever either Cooper or Lawrence were on-screen. Good review Tom.